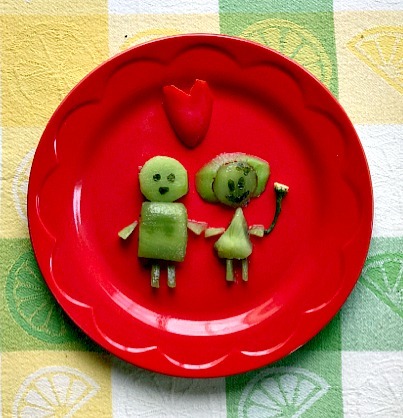 Try our fun food art ideas to get creative and put a little more kid-friendly fun into Valentine’s Day this year! Valentine’s Day is around the corner which for many people means sweet chocolates, red wine, beautiful roses, and juicy steak. While all of these are very traditional, they can get a bit boring! Where is the surprise, and where are your kids in this picture? They’re your loved ones too! By now, you might have already planned out the day with a romantic surprise or even just decided to treat it as a typical day since it falls on a weekday this year. It’s not too late to change that! Have fun with food art! Food art is a perfect holiday activity for kids. 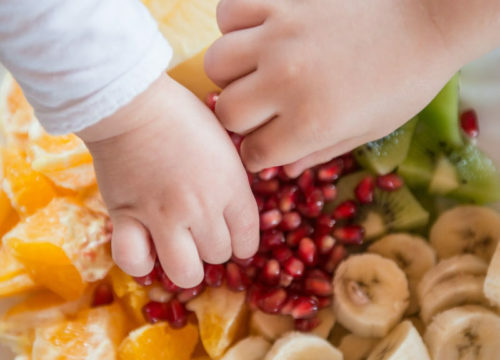 Not only is making food into art fun, but research shows that when kids are presented with healthy food in fun shapes, they are more likely to eat it! These creative ideas can be done with your kids, and the finished product can be a surprise that your partner will love. These ideas are super simple, low cost, and won’t take you hours, perfect for a more abbreviated weekday Valentine’s Day celebration. After all, it’s a school night. Treat the dish as your canvas. You don’t have to buy special ingredients or take on the challenge of a top chef level recipe. 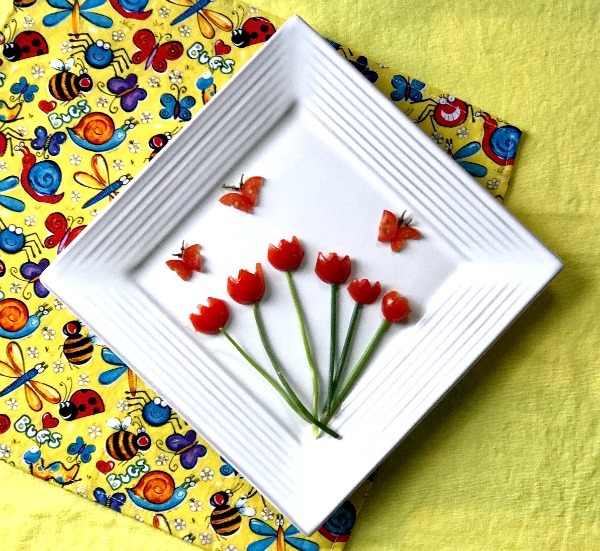 Just add some simple, edible decorations to make the dish pretty as a picture! Flowers are a must-have element for Valentine’s Day. Skip the expensive florist and make edible flowers instead! Use cherry tomatoes and parsley stems from this simple idea that can be served as an appetizer or snack. First, cut the cherry tomato in half, then make a sawtooth shape at one end. The tomato will be like the bloom. Combine with a thin stem, such as parsley, and your flower is ready to set on top of any dishes. You could also add some tomato butterflies like what’s in the picture below for an extra touch! Lovebirds are an adorable symbol for Valentine’s Day. 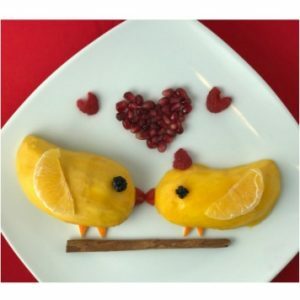 We used mango, raspberry, blackberry, tangerine, and pomegranate but you can use other fresh or frozen fruits to create your lovebirds, such as melon instead mango, blueberry instead of blackberry, strawberry instead of pomegranate, etc. 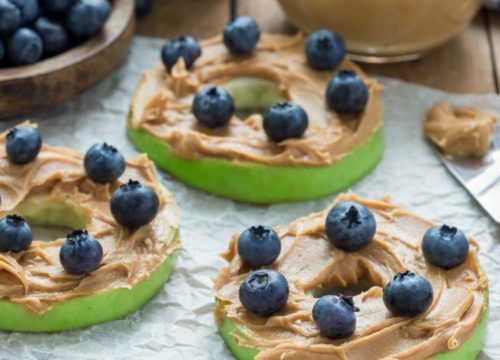 Get creative and use fruit you have on hand!. Use the photo below as a guide. 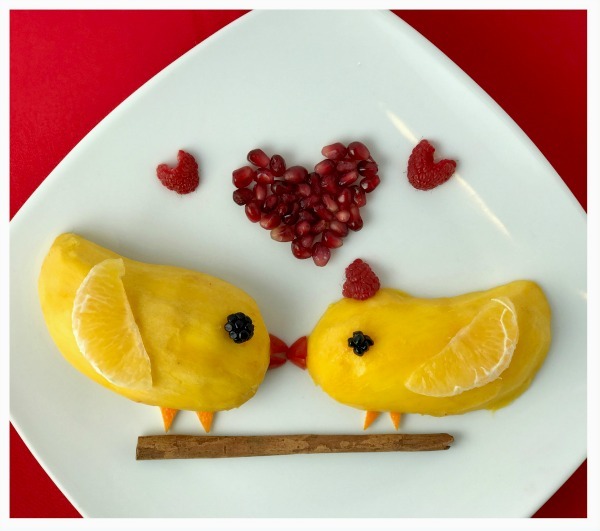 Cut the mango in half to make the bird’s body, use a blackberry as the eye, a tangerine section as the wing, the tangerine peel as the feet, a raspberry for the beak, and the last and most important—arrange raspberries or pomegranate to make the heart! Use food to draw a healthy family photo. Sound like a huge project? It can be done with just 3 ingredients: kiwi, strawberry and dark leafy vegetable (spinach). Your kids could even make it by themselves. Cut the kiwi into circle, square, and triangle slices. Then arrange these pieces to create bigger adults and smaller kids. Use stems of spinach or green herbs for arms and legs. Tear off smaller bits of spinach or green leafy veggie for facial features. Then, cut a strawberry in half lengthwise, but don’t cut all the way through. Open the strawberry like a book and layout for your heart! Making Valentine’s Day special can mean just a simple activity with the family. Plus, this fun project doesn’t involve all the normal extra sugar or fat that often accompanies this holiday. All you need is some fresh, wholesome produce, and you’ll have a Valentine’s Day celebration that everyone will love. 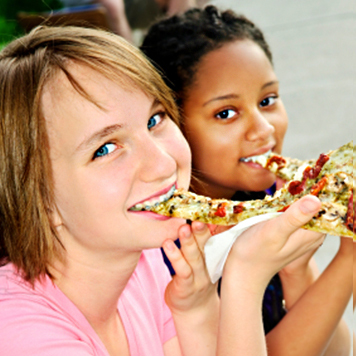 See our tips for healthy holiday parties at school or home. 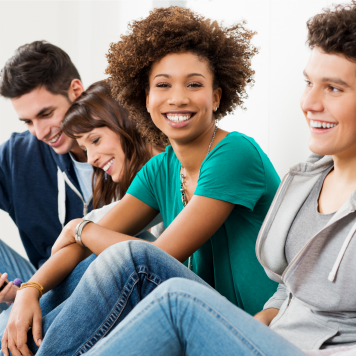 Helping Your Teen Maintain Healthy Habits During the School Year!